Looks like Dr. Boom is at it again. The latest card to join the Rise of Shadows expansion was revealed to players through a surprise email from Blizzard. The Boom Reaver might be a Hearthstone card, but he looks like he is ready to fight Godzilla for control of Japan. This card carries a hefty cost coming in at 10 mana, but his effects and stats might just make him worth it. 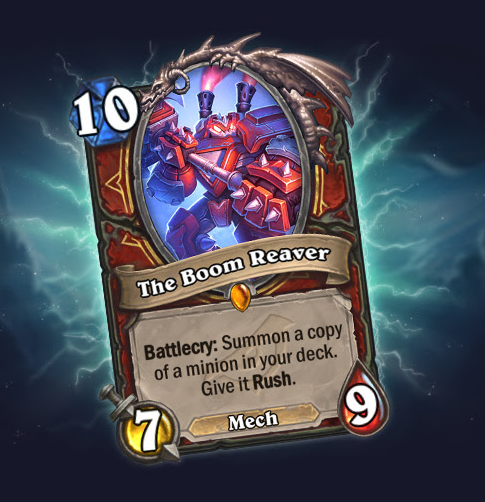 The Boom Reaver has seven attack and nine health, but also has a unique Battlecry. After playing The Boom Reaver, you summon a copy of a minion from inside your deck and give it Rush. This means the minion that Boom Reaver pulls from your deck will be able to attack an enemy minion as soon as it comes into play. For those who haven’t been following closely, the Rise of Shadows expansion is being ushered in by League of EVIL villains. Each of these villains is associated with a class within Hearthstone. The Warrior class is associated with none other than the mechanical Mastermind Dr. Boom. Players might remember Dr. Boom as the face of the Boomsday expansion or as his own Legendary card from Goblins vs Gnomes. If players are somehow unfamiliar with Dr. Boom, they will soon learn of his engineering prowess. Check out The Boom Reaver and all his Mech pals when Rise of Shadows drops on April 9.